The Company believed the fire was set deliberately. An attack meant to send them an ominous message: leave the area, trade elsewhere, or die. The actual accounts of what happened, however, remain sketchy. Two Company men, John Leask and John Smith, claim that on the night of May 11, they fled the post fearing for their lives. Soon after, they say, the buildings were burned to the ground. That no one was ever charged with the crime did not make much difference to the head office in London, England. Everyone in the Company knew who was behind it: the Canadians. What happened that summer on Missinaibi Lake, 525 kilometres south of James Bay in the remote boreal forest of Northern Ontario, was the beginning of a corporate battle unlike any other in history. A bloody, dangerous struggle that would last 45 years, span thousands of kilometres and, by its end, shape an empire, destroy cultures and transform a vast wilderness into what we now call Canada. Some people refer to this simply as the “fur trade,” but that name misses the drama entirely. The competition between the Hudson Bay Company and its upstart rivals from Montreal, the North West Company, was quite simply a hostile takeover like never seen before, or since. It had it all. Blood. Bribery. Betrayal. And now, 229 years after that infamous fire, we have come back to the Missinaibi in search of evidence of this epic battle. Our expedition, as an idea, is slightly insane. After all, we are not looking for evidence of this struggle on land. That has been done many times before. Archaeological digs abound all across the country. Forts have been excavated. Old canoes, tools and guns have all been found. We want to explore the more hidden aspect of this great story: the artifacts lost under water. The rivers across Canada were the highways and byways of the fur trade and hold secrets from our past. What went overboard during all those thousands of canoe trips, through whitewater rapids and terrible storms? What debris did they throw out from the forts that sank to the bottom? In important fur-trade routes like the French River, all sorts of artifacts have been found beneath the surface and put on display in museums. But many other river beds, like the Missinaibi’s, have remained, essentially, untouched. Our mission is to spend seven days paddling and scuba diving a crucial section of the Missinaibi River, including the fort where Leask and Smith fled for their lives back in the summer of 1780. It takes a special group of people to want to join a trip that entails whitewater scuba diving and a brutal amount of lifting. But then, the fur traders themselves were special men, true wilderness survivors who took on much more ambitious challenges—challenges that would crush most of us today. People like Alexander Mackenzie, the Wayne Gretzky of his day, a gifted explorer who paddled and marched across the continent mapping our vast rivers while surviving the toughest conditions. And like Wayne Gretzky, he famously switched teams, ditching the Hudson Bay Company where he started his career for the North West Company, where he tried to destroy his old masters. I have to find my own version of this kind of toughness, and there are not too many. But I know the perfect person: Survivorman Les Stroud. It’s like the new math: Unusual adventure + Les = Yes. We need to be very strategic about the rest of the team. You can’t simply dive into cold-water rapids and go hunting for history. It’s not just illegal, it’s unethical. The Missinaibi River was the most critical transportation route in northwestern Ontario, connecting the Hudson Bay Fort on James Bay to Lake Superior, and it was designated part of the Canadian Heritage River system in 2004. Much of it now lies in a provincial park, so you have to respect the rules. Working closely with the Ministry of Natural Resources and a genial, certified history buff from Ontario Parks named Dave Sproule, we pick a route that we hope will take us through some of the best sites to dive. Dave’s job title is almost as long the river we are about to paddle: Ontario Parks natural heritage education and marketing specialist for parks north-east zone. What the title doesn’t communicate is the depth of Dave’s passion for the North and this period of history. He chews through information like a beaver going wild in an alder stand. I marvel at how Dave spouts this dizzy array of dates off the top of his head. Even he is aware of his savant-like quality and stops himself to apologize for it. “You have to be careful how much detail you tell people,” Dave says sheepishly. “I love all this knowledge, but it can bore some other people to death.” Fair warning. Still, with Dave alongside, I know we had the history part pretty much covered. Next comes our dive team. Master instructor Paul Davies and dive instructor Steven Rodgers both have more credentials than can fit on the back of a scuba tank. They have done multiple dives on what many call the “Canadian Titanic,” the wreck of the Empress of Ireland. On the eve of the First World War, this huge passenger liner collided with another ship and sank in the frigid waters of the St. Lawrence River, near Rimouski. More than 1,000 lives were lost, making it the worst maritime disaster in Canadian history. It is to divers what K2 is to climbers: highly technical, difficult and dangerous. People who do this kind of dive respond well to a challenge. Paul shrugs happily. It is virtually impossible to unnerve him. He exudes calm, like the still waters of a twilight ocean. With his shaved head and lumbering presence, he’s acquired the nickname Buddha. It fits. He teaches yoga and meditation and the license plate on his truck is imprinted with the traditional Hindu greeting, “Namaste,” meaning, “I bow to the Divinity within you.” I try to think of Paul getting cut off by another driver on the highway and instead of flipping him off, Paul just gives him a little bow. “It’s all good,” he says, like a mantra. Next comes the academic. We need someone who understands how to identify artifacts and who is willing to do it under extreme conditions. Discovering Kimberly Monk is like uncovering a gold doubloon. 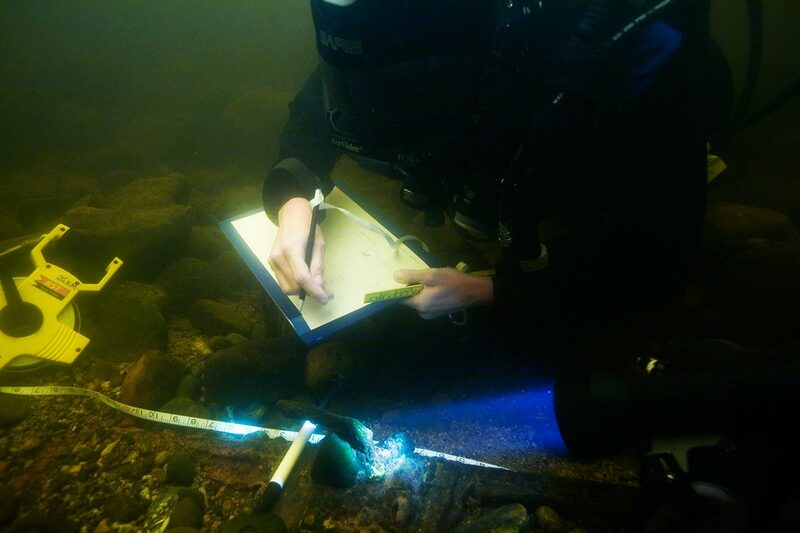 A 35-year-old Canadian marine archaeologist working in Bristol, England, she has extensive experience diving for shipwrecks and excavating underwater sites. And best of all, she has a long-standing interest in early furtrade history. Though she is more used to diving in Caribbean waters than in the Canadian North, she promptly flies across the ocean and signs on. The rest of the team comes together quickly. Our photographer, Laura Bombier, is A-list and has shot for Outpost before, followed by the two cameramen, Andrew Sheppard, who works regularly with Les, and Bob Hilscher from the CBC. (We are shooting a documentary of the trip for The National.) We also hire the Missinaibi Headwaters Outfitters, run by the young, riversavvy guide Matt Howell. Like all good outdoor people, Matt talks in actions more than words, and quietly takes charge of the logistics. He hires his key assistant, an ex-military man, James Black, and a cook, Jody Grant. And finally, we add one surprise addition to the crew. Les Stroud’s son, Logan. In all, 13 people and six canoes gather in Timmins, Ont., in August to begin this seven-day trip. We will start near the burnt HBC fort on Missinaibi Lake and paddle downriver through a series of rapids toward a place called Peterbell, where we will pull out. It is not a long paddle, but we need to focus on diving the three main sites—Missinaibi House, Quittagene Rapids and Long Rapids—and that will take time. Not to mention the logistical challenges it poses. After a three-hour drive north from the Timmins airport, we load our gear into the canoes at Barclay Bay on Missinaibi Lake. Les is right. It doesn’t fit. We desperately try to cut down as much weight as we can, leaving bags of gear behind to be picked up later. But like every diet, you never lose as many pounds as you hope. We are still fat. Deal with it. The plan is to paddle to our first base camp at Quittagene Rapids, just 10 kilometres north, where the lake ends and the river begins. It is just past the Missinaibi House site, where we are not allowed to camp. Seeing our loads, the park warden, Adrien Lacell, who has come to meet us, takes pity. He offers to motor some of our gear up to the portage site. Handouts like this are never refused. And since we suddenly have Adrien’s boat at our disposal, we decide to take a side trip to see one of the most famous sites on Missinaibi Lake: the pictographs at Fairy Point. Long before the fur traders ever got here, this was First Nations land. Their Cree history—which turned tragic virtually the day the first fur traders arrived—cannot be ignored. As soon as we get out on the water, the storm hits. The rain slashes down on us and we duck under the boat cover. Adrien’s 90-hp aluminum craft is sluggish under all the weight and we chug along for a wet 35 minutes. Historically, the pictographs have been approached via canoe, the reward after a long paddle up from Lake Superior. By motoring over it feels like we are breaking some sacred contract with the river in the service of our tight schedule. I start to think of Rosie Ruiz, the woman who cheated in the Boston Marathon by taking the subway and then claimed to win. But there is no sense pretending we are trying to recreate a voyageur canoe trip. We are not. We are here to scuba dive the river and look for artifacts. Evan and Les tackling the Missinaibi River. The motor drones on. The Aboriginal pictographs of Fairy Point are located where the three long bays of the lake meet, as if at the crux of a prong. It is one of the deepest parts of the lake and has been a sacred spot for First Nations people for hundreds, perhaps thousands, of years. Sheer granite cliffs 30 metres tall slash down into the water, while centuries-old stands of red and white pine tower above. There is a strong cross-current here as well, and many reported drownings have occurred over the years as unwitting canoeists were suddenly caught by an upsurge in the chopping waves. It is hard to avoid the sense of awe here and as soon as we arrive, the rain stops. It’s as if a spigot has turned off. The clouds open and a warm light turns the south-facing cliffs golden. A ridiculous rainbow appears on the horizon. It’s so unreal to us all that it is almost suspicious. We float up to the pictographs. There are more than 100 of them. You can almost imagine someone standing in a canoe, reaching up and drawing them. There are depictions of caribou, moose, lynx, bear and canoes, as well as a representation of what is thought to be the Aboriginal god, Mishipeshu. The most famous pictograph, however, is quite bizarre, like something you would see on the wall in a kindergarten room. A happy-faced circle with a bunch of legs dangling from it. It has become known as the “smiley face jellyfish man.” I can’t help but laugh when I see it. Just what it is actually, or what it means, remains a mystery. Les’s friend, the canoeist Hap Wilson, wrote a wonderful book about paddling the Missinaibi River called Missinaibi: Journey to the Northern Sky. His description of the pictographs delves into their spiritual significance, how the Black Duck shamans went into visionary trances and purification rituals before dipping their fingers into crushed red-ochre pigment and fish oil and applying it to the granite surface. The Ojibwa, Wilson writes, believed that the “memeqwaysiwuk” or the “rock people who speak strangely” used to steal fish from humans and then paddle their stone canoes straight onto the Fairy Point cliffs and disappear. No one who visited here left without leaving an offering of tobacco. Wilson regards these drawings as holy. As usual, Les has a point. After all, not everything that survives through history is steeped in deep symbolism. Most of the evidence of our current existence—our old shoes, our used CDs—will not exactly become museum worthy. We tend to view the past through our own biased lens, forcing ideas we want to believe in onto things that, perhaps, don’t have that meaning at all. Maybe that makes the past more compelling to us, or validates our current experience. Either way, Les’s warning about the dangers of romanticizing our past is a good one. On the other hand, all too often we do the opposite: graze over the work the past requires and simply imagine that our own experience is universal—that our world view, our sense of the sacred and profane is somehow shared throughout the ages, and that to believe otherwise is some kind of academic pretense. That route can lead to a kind of narrow-mindedness and a disrespect of different cultures. As these arguments swirl around my mind, Laura takes some pictures of Les and I for the magazine while Bob shoots video for the TV doc. They want us in front of the pictographs and we comply. All of us know the drill here. We make a living in the media and posing for pictures comes with the job. Trying to find a balance between popularizing the past without exploiting it is tricky and here it seems like we are not getting it quite right. Like the cross currents at the base of Fairy Point, I feel my hypocrisies and contradictions sucking me down. I crumple a cigarette I have brought along and quietly make a small tobacco offering over the side of the boat. The darker I feel, the lighter the evening becomes and soon we motor back toward the mouth of the river in undeserved sunlight and warmth. By the time we unload the gear, portage it to the river and paddle to the campsite, it is already close to 10 p.m. The moon holds back the dark. As I unpack some gear, I see the silhouette of a beaver swimming across the narrows. There it is. The prize itself. The animal that this trade war was fought over, that drove so many men to take terrible risks and suffer so many privations. In exchange for provisions like guns, clothes and alcohol shipped from Moose Factory, thousands of whole beaver pelts—used then as a currency called MB, or Made Beaver— were sent downriver to be shipped back to England. I watch the animal swim and marvel at the role it has played for so long in our history. How close it came to total extermination under pressure from the trade. Seeing it here is actually a more important find than any artifact could be. The beaver is, miraculously, the ultimate survivor. We are all exhausted and after a quick meal and tent set-up, we head for a much-needed sleep. Being on a river is another kind of home, and after only one day I can feel its power erasing memories of city life. But I am anxious about tomorrow. What will we find under water? What is it like to dive a rapid? We are in a rain forest. That’s how it feels at 6:45 a.m. on the Missinaibi at Quittagene Rapids. The whole place is dew soaked, but we are ready for our first dive. It’s been a comfortable night. Those small gear decisions can make all the difference: a good, down-filled sleeping mat, a fleece pillowcase that you stick clothes in, extra dry socks. As Les says, any fool can be uncomfortable and cold. There’s no macho in that. The truth is, though, we are seriously comfortable. Almost to the point of feeling guilty. Jody hands me a pot. Are you kidding? Service in the bush? Having the outfitters here makes us all feel like those rich bourgeois who travelled along with the voyageurs on the great canoe runs. Sitting in the middle of the long boats, often wearing top hats, the bourgeois were essentially passengers, the elite managers who left the hard paddling and portaging to the voyageurs. In other words, they were soft. I look at Matt. He’s just so damned…nice. And all that food. “I can get it myself,” I say. Even I know how lame this effort at self-sufficiency really is. Les, however, doesn’t have any of these idiotic reservations. After all, the guy has nothing left to prove in the toughness department. “I’ll take a coffee,” he laughs. I let Matt pour me another cup as well. Taking notes under the Missinaibi waters. But our work comes soon enough. Steven and James have been running the compressor for hours, slowly filling the tanks. It is grinding work and the acrid smoke from the machine crushes the fresh air. Meanwhile, we scout Quittagene Rapids. We have to imagine how the fur traders might have run it, where their canoe might have dumped in an accident, and where the debris would be washed down. It is not a science, by a long shot. 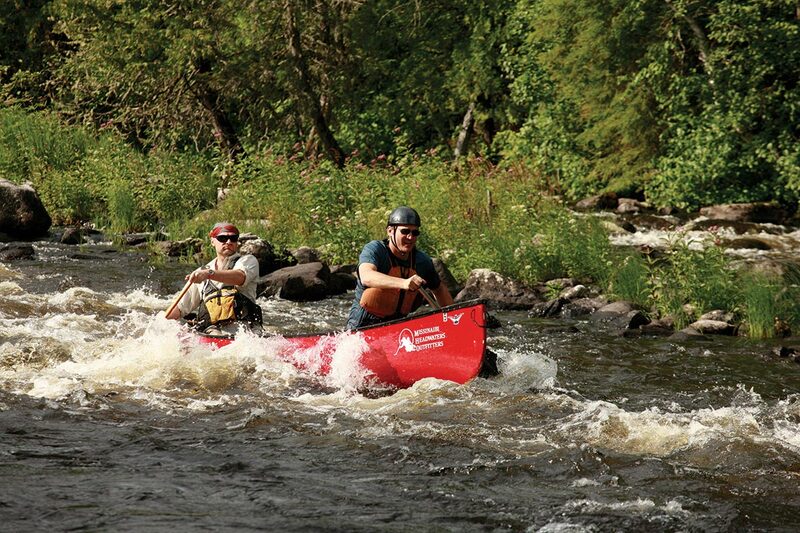 From a strictly paddling point of view, Quittagene Rapids is an advanced Class II, with a few technical bits. There are some submerged spikes—from an old dam that was once used here during the logging days—that have to be avoided. Hap Wilson describes how Quittagene Rapids “has taken more than one life over the years,” which serves as a sobering reality check. We portaged it last night in the dark, but now we need to get a genuine feel of the rapids before we dive. Les and I decide to run it a few times. Les has tremendous experience paddling whitewater, but he hasn’t done it much over the last number of years. He’s been too busy on other projects, such as hosting Shark Week for Discovery Channel. So he is both excited and, I think, a bit apprehensive as we start. Well, at least, I am. With the water levels low, the rapids are slightly more technical than usual. We’ll have to ferry across to the left side of river and then, as we enter the whitewater, draw our bow to the right of a rock and point straight into the V-shaped rollers. Eventually, we will finish down the middle. Our position is perfect as we slide on a slight angle to approach the first tongue. “Draw now!” Les calls to me from the stern. I respond, leaning out and digging in my paddle. Les keeps his in the water, well behind his hip for maximum control, and we shoot through. The waves are high as we bounce and dance down, the canoe sinking so deeply into the troughs that at times it seems to disappear entirely in the froth. But it is really more of a thrill ride than anything genuinely threatening, like a good roller coaster at the fair. At the bottom we eddy out and, smiling like six-year-olds, we pull up on shore where the dive team is prepping. “God, I miss doing that,” Les exclaims. For a moment I catch a glimpse of what Les’s life was like before his adventures took him to the most exotic locations on the globe, before he became a “brand,” when running a rapid on a river in his home province was the whole world. From the look on his face now, I think it still is. We decide to dive both sides of the rapids, as close to the current as we can without getting swept away. But the most important area, we conclude, will be river right, where we think the water would spit out any artifact that fell out of a dumped canoe. Our dive prep site is a tiny, muddy beach at the foot of the rapid. It quickly gets cluttered with gear. Bags of dry suits and wetsuits. Weights. Tanks. The generator. Everything getting wet and muddy. We also bring food, as the campsite is about 450 metres down the river. “The muddy ground means there will be low visibility under water,” says Paul. “It won’t clear up until we get right into the current. If it goes to zero, we will do touch diving.” That means you actually hold on to your dive partner. “You have your flashlights?” Steven asks. He’s always so conscientious. Good divers leave nothing to chance. But the current poses other problems. How do we stay together under water? And how carefully will we be able to examine the bottom? It takes longer for the compressor to fill the tanks than we imagined. Thirty-five minutes per tank. We decide that Kimberly and Paul should do the first, scout dive. 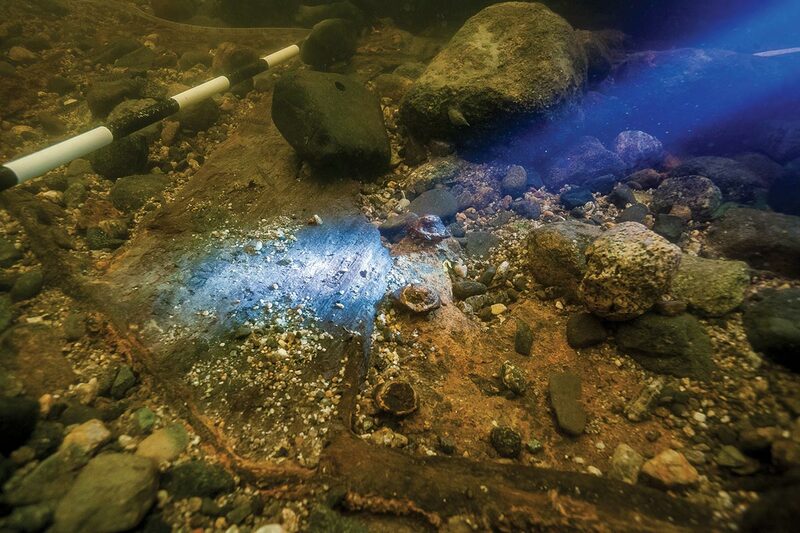 They bring a metal detector, measuring sticks and the best underwater flashlights they have. They gear up in their dry suits. The water temperature is about 62 degrees F (17 C), not terribly cold. And the diving will be shallow, not more than five metres deep. That means we will be able to be in the water for hours at a time. But even at this temperature, after a long dive, our core temperatures will fall. Especially those of us wearing wetsuits, like me. At 10:30 a.m., with the generator banging away, Kimberly and Paul finally leave the shore. They sink into the muck and have to slide into the water as gracefully as possible. “Let’s get negative,” Paul says to Kimberly, and they sink out of view. From shore we watch their bubbles burst to the surface and wonder exactly what they will find. Steven keeps filling more tanks. Les and I and the rest of the dive team prep our gear. We have made an agreement that if any diver finds an object of interest that they want marked, they will surface and make a fist with their hand. Then a canoe will come over from shore and we will mark the spot so other divers can go down and take measurements and photographs. That’s all we are allowed to do. While we appreciate how careful the ministry has to be with these sites, the archaeological license they have granted us is surprisingly restrictive. It does not allow us to touch anything we find, let alone bring it to the surface for closer inspection. It is basically a “look but don’t touch” rule. Our hands are tied. In any case, there is no “sign” from the divers. When they do finally surface, the reports are bleak. “Not much so far,” Paul says. They have spotted loads of fishing lures, a Coke can of distinct modern vintage—no accounts in the HBC journals of traders drinking a cool, refreshing soda—and some old sunglasses. Again, debris from our era, not from the one we want. More tanks are filled. Les, Laura, Andrew and I gear up. 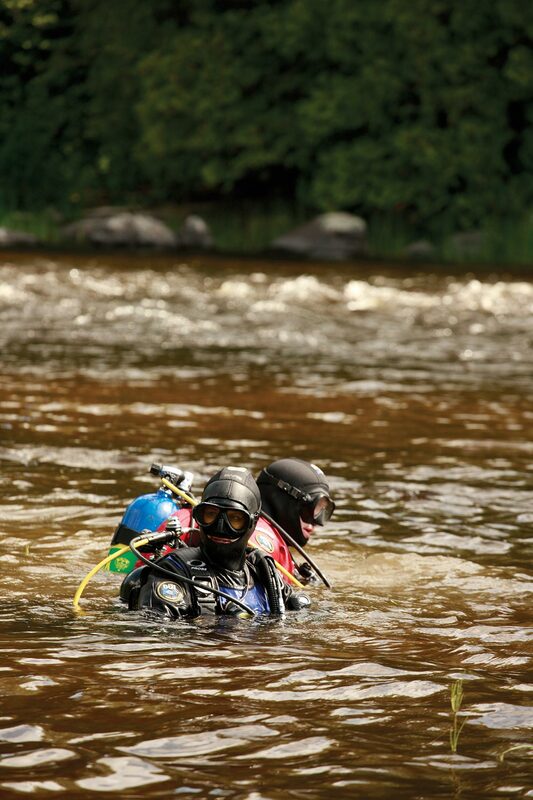 If equipment matters in camping, it is also true of diving. Andrew and I are in wetsuits, not dry suits, and while we will be colder, wetter and more miserable than the others, we have one advantage: we can pee at will. On a shallow dive that can last a few hours, that is a major asset. Peeing in a dry suit, however, is a more complicated endeavour, and there are all sorts of contraptions that divers utilize to make it happen—the two-holed condom for men being the best. Others just try to hold. A pee malfunction in a dry suit is a major pain. Entering the water from shore feels almost like a marriage proposal. Same jumpy nerves, the sweaty excitement. You’ve been waiting so long to do this, but the truth is, you have no real idea what will happen. In any case, hope is never more powerful than at the beginning of a marriage, or a search, and as my fins sink into the muck, I put my regulator into my mouth and fall blissfully into the river. My fins touch the muddy bottom and immediately the visibility goes to zero. Even in just a few feet of water that zero visibility takes a moment to relax into. Flying blind. I kick gently out into the river where the current picks up and the muck washes away. Immediately visibility returns. Les comes up beside me, with his light. He also has an underwater camera and we give each other the “OK” sign. We head deeper. The current bends the long green plants downstream and we swim over the rocks on the bottom, the sunken logs and the branches of trees. Huge snails abound, giant crayfish and fat leeches, and empty clamshells left by hungry otters. In the green distance, a walleye lurks. We focus on the bottom and start our search for artifacts. It is slow, methodical work. Like Paul and Kimberly, we see fishing lures, bottles and pieces of glass. But nothing definitive from the era we seek. An hour passes. As I try to concentrate on the bottom, my mind drifts a bit to that beaver I saw last night. I realize that this is his world. This is what he knows. We have all seen the fur trader’s point of view from our canoes, and to a lesser extent, the Aboriginal point of view, but here we are experiencing that darkest view, the view of the water itself, which the voyageur never got a chance to know. They only ever skimmed the surface of this place. Most of them could not even swim. As I dive out into Quittagene Rapids and feel the hard tug of the current, I feel like I am gaining access to some secret world, a world that holds not just our past, but somehow, our future as well. Scouring the river for remnants of a fur-trading past. But for all the emotion, still no artifacts. It is slightly depressing. Even though we know not to expect much, it is hard not to have high hopes. We want something from the fur trade to confirm that diving the rapids is a decent idea at all. That we have not wasted our time. Seeing it is undoubtedly exhilarating, but it is not a bonanza. To me, it seems more Mother Jones than Indiana Jones but at least it’s a start. I have to fight to make sure my impatience doesn’t take over. Archaeology sees time in geologic terms, not second hands. Impatience is pointless. We keep diving for the day, scouring Quittagene Rapids. As evening falls, Paul and Steven find something of real interest. It looks like a wooden frame of some sort, but the light has fallen so low that they really can’t make it out. And Paul has been diving for so many hours that even in a dry suit, he is cold. We all are. We resolve to mark the site and come back and dive it the next day. Back in camp, Jody and James have caught some fresh walleye—which are cooked to perfection in a special batter James has made. We eat the fillets and wonder if anything has ever tasted so delicious. Les’s son, Logan, who also dove today, has a slightly different menu. He gulps down two fried eyeballs from the walleye. I guess eating fish eyeballs is just something you gotta do if you are Survivorman’s son. I wonder if my own kids would ever acquire that taste? Not from Dad, that’s for sure. That night, as we plan the next day’s dive, James starts a fire with a bow drill—just sticks, string and some wood. It is a remarkable performance. For 20 minutes, he works up a sweat, one arm bowing back and forth with the drill he has just made, the other pressing down on top of the wooden drill bit, which makes a deep divot in another piece of wood. At last, a tiny, precious coal tumbles down. James drops the bow and hunches over the coal. “This is the tricky part,” he whispers. Slowly, almost tenderly, James wraps the coal in a bundle of cedar tinder like an egg in a nest. Very gently, steadily, he blows. There is a hot, yellow glow inside the bundle and then, suddenly, whoosh. Now he has it. It erupts into flame. He stops blowing instantly and the flame relaxes into a quiet, solid burn. Just seeing him hold the fire bundle in his hand is like being at a magic show. We actually clap. We pass the bundle around taking turns blowing at it. Self-sufficiency like this has become an exotic, endangered species. Like Les’s alter ego, James, works diligently and unceasingly at virtually everything. He cleans fish in seconds, chops wood, fills tanks and is generally indispensable. He regales us with tips and observations. What sap and tree gum were used to fix the canoes? What bark can be used to make aspirin? What reeds can we boil and eat? He’s spent his life outdoors and watching him work you can’t help but feel that he, too, has channelled the spirit of the voyageur. To top it off, he is slightly claustrophobic and so forgoes the tent and sleeps outside under a tarp or the canoe. He is proving to be a survivorman in his own right. 5 a.m. I wake to the sound of the beaver splashing his tail in the water. A barn owl hoots, its cry sounding like “Who cooks for you, who cooks for you?” I watch the trembling aspen outside the tent vibrate in a gentle breeze, and then fall back into a boreal-forest sleep. It’s another cloudy day, threatening rain. We gear up to dive Quittagene one more time, relocating the wooden frame from yesterday. Les surfaces because the underwater camera keeps fogging, so we give it to Andrew to clean on shore. We sit in the water for 25 minutes and I feel my core temperature dropping. Finally, we are ready to film the artifact. We swim across the river, but are instantly grabbed by the current—you can try to fight it but it is pointless. It carries us away. We watch the rocks and logs drift by until the current slackens, and we can make it across to the artifact. Upon closer inspection, it appears to be an old door of some sort, made of iron and wood. Kimberly suggests it is likely from a logging camp in the early 20th century. Again, we are mildly disappointed. Les has to pee and has no diaper in his dry suit so after filming the artifact he makes his way back to shore for a short break. I decide to warm myself in the water the old-fashioned way. When he returns, we dive for several more hours, but with no more luck. Quittagene Rapids is not proving to be overly fruitful. Over the next two days, we resolve to make our way to Missinaibi House and dive the shallow waters around the fort, where the famous fire took place. We have reduced our expectations for Missinaibi House. A real estate agent would say it has no curb appeal. Situated on a small, marshy outcropping called Nemekee Point, the site is the definition of forgettable. In fact, on the Adventure Series topographical map we are using, the old fort is actually wrongly located one kilometre away. History has not just forgotten this spot, it’s now rubbing it in. Reeds grow around the shore and the land is covered thickly with aspen. Even the old ministry sign marking this as a historic site is so smothered by overgrowth that it’s almost fully hidden. We set up a base camp and begin the day. 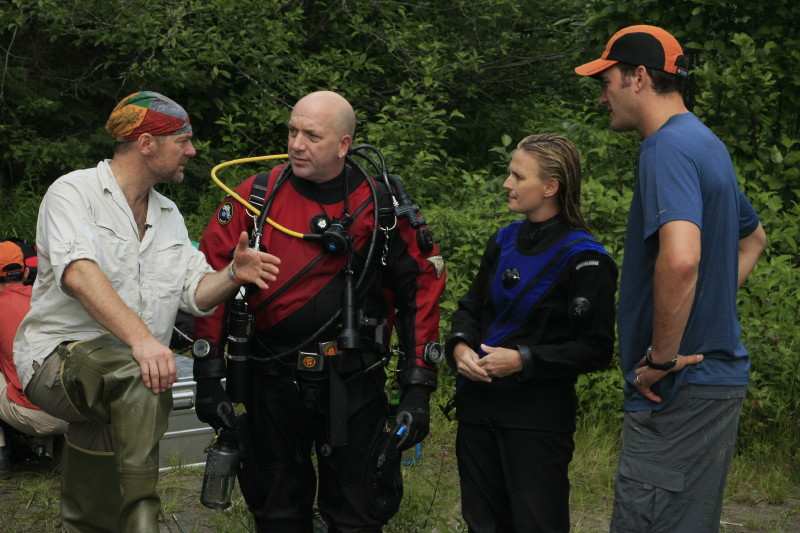 Feeling slightly absurd, Paul and Kimberly don their dry suits, grab the metal detector and begin to—well, “dive” might be a strong word to use. While they hit the water, Dave, Les and I discuss how critical this little spit of land is to the history of our country. The two great French explorers Pierre-Esprit Radisson and Médard Chouart des Groseilliers paddled past here on their way from Lake Superior to James Bay. They immediately realized what a valuable trading route this is to the fur trade but are baffled when the French government does not see their point. The French are too focused on the land around the Great Lakes to care about the North. It is a monumental error. The two explorers promptly go to the English, who grasp their theory instantly. And so, in 1670, the Hudson Bay Company, a Company of Adventurers, is chartered and given exclusive trading rights to all land draining into Hudson Bay. The English have arrived. For more than a century, their monopoly over the fur trade goes unchallenged. The HBC rule the land with the authority of a monarch and treat its subjects with aloof disdain. As John Rowand, the chief factor of the HBC Edmonton House wrote: “We know only two powers—God and the Company.” The Aboriginal trappers have no one else to trade with and so they become dependent on taking their goods all the way from the interior of Canada to the HBC forts on the coast of James Bay. Eventually, however, power starts to rot The Company. As Peter C. Newman writes in one of his three seminal volumes about the fur trade, “They had been content to sit in half a dozen forts huddled around the shores of Hudson Bay bartering axes, guns and blankets for pelts with visiting Cree.” That is until the Canadians arrived. If the HBC represent the ultimate top-down corporate culture, the Nor’westers are the rebel entrepreneurs. In 1779, a group of 16 Montreal businessmen—led at one point by the indomitable Simon McTavish—form a partnership that intends to challenge the HBC’s monopoly. Instead of hiring Scottish Orkney Islanders like the HBC, who refuse to learn anything from the Aboriginals, the Nor’westers hire French Canadian voyageurs who are deeply immersed in Aboriginal survival skills. Instead of a codified corporate pay structure, the NWC give their employees financial incentives to deliver furs. Work more, make more. There are bonuses based on speed, loads carried, and Made Beaver pelts acquired. Unheard of at HBC. Instead of strict, uniform discipline and deference to authority, they encourage a wild, gang mentality, letting their men dress in dramatic colours. They cultivate a culture of machismo. Their corporate logo, a rearing horse surrounded by a blazing red circle, matches the famous crimson sashes the voyageurs wear flamboyantly around their waists. And no fancy Latin taglines. Their motto is simple and uncompromising: “Perseverance.” And persevere they do. Like Apple computers taking on IBM with their elegant little Macs, the Nor’westers bring in new technology. Some use 36-foot long freight canoes, called canots de maître, to make the epic paddle up the Ottawa River, across the north shores of Lake Huron to the head of Lake Superior. Powered by a dozen men, these monster boats can carry 2,800 kilograms. But to the Nor’westers, this is nothing. These men are known merely as “the goers and comers.” These men paddle manoeuverable, whip-fast, 24-foot canoes that can still hold a ton-and-a-half worth of cargo. They are the Top Guns of the fur trade. It becomes an army. At one point, the NWC has more than 1,100 voyageurs scouring the rivers around Canada, making maps where once there was only legend. And they all have a singular mission: Intercept the Aboriginal trappers before they get to the HBC forts. Offer them anything to make their trades. Better prices. Better provisions. More alcohol. And if the HBC men actually try to interfere, try to protect their monopoly? Very quickly rules governing competitive civility sink to the bottom of the rivers. It works. After only 20 years in business, the North West Company controls almost 80 percent of the fur trade and the Hudson Bay Company teeters on the brink of collapse. The voyageurs are collecting more than 100,000 beaver skins and tens of thousands of other fur-bearing creatures, from foxes and bears to muskrat, deer and buffalo. It is the cash machine that builds the mansions of Montreal. And much of it starts where we now stand. The Hudson Bay can see it coming. The whole purpose of building Missinaibi House in 1777 was to try to compete with the upstart Nor’westers. HBC journals from the time talk about the need to “intercept those Indians who Trade with the French Pedlars” and convince them to keep working with The Company. The method which The Company men use to win their suppliers’ loyalty back are still staples of sales forces today. This passage from the HBC Moose Journals, quoted by Doug Baldwin, says it all: “We apprehend that the only method to regain that Trade will be to send proper Persons from each Factory with Goods and Brandy to Proper Stations upon their Track and thereby underselling them, and using every other means of ingratiating ourselves with the Natives, Endeavor to make it not worthwhile of the Canadians to come there any more.” No such luck. When Leask and Smith flee Missinaibi House in 1780, they believe the North West Company has already warned all the local Aboriginal traders not to trade with them on pain of death. In fact, they are convinced that the NWC hired the Aboriginals to burn the fort. As Dave, Les and I walk the overgrown land, this history comes vividly to life. Steven is beside us using the metal detector. Suddenly it starts beeping crazily. There is metal everywhere, lying in the bush and buried in the sand. Old barrel rings, rusted cans, nails. But it is not surprising to see so many fragments and relics from the past here, given how elaborate the structures were. Inside the large palisade were log houses, a canoe house and a magazine among other buildings. Outside there was a three-hectare vegetable garden and potato patch, as well as a dairy. 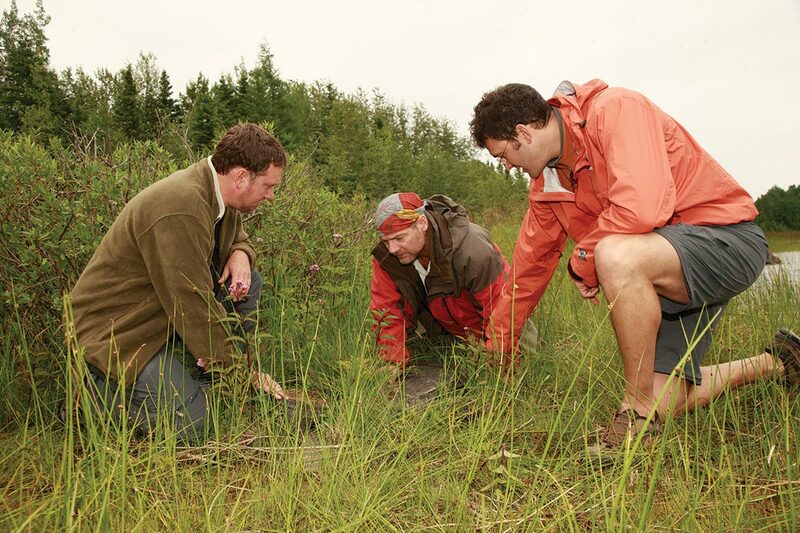 The expedition leaders search the land for clues. We continue poking around on land as the metal detector beeps happily, as if in time to our hearts. But suddenly there are shouts from the water’s edge. We race back through the bush. If we are surprised by what we found on land, what Kimberly and Paul are discovering in the water leaves them breathless. “There’s lots of materiality here!” Kimberly says excitedly, throwing her arm out to the harbour. “Materiality!” she repeats the archaeological jargon, then sees that we don’t get it. We wade out to see the “materiality.” They show us some iron barrel hoops dating from the late 19th to early 20th century and then some iron threaded bolts from a similar period. As we look at the objects, leeches attach themselves to our legs and gorge. We barely notice. “Look at this one!” Kimberly says, pulling us out farther from shore. It is part of a Gordon’s Dry Gin bottle. “The word ‘England’ is embossed right on it.” She examines it under water more closely. The mould bottle is indented and embossed with a wolf head, the modern day Gordon’s Gin bottle emblem. Kimberly later dates it to between 1909 to 1913, consistent with the time HBC ran the fort here. “This so reminds me of home,” Kimberly says. It also reminds us all of the significant role that alcohol played in the fur trade. From the very beginning, both the HBC and the Nor’westers used alcohol as a currency and as a deadly tool. It became one of the chief weapons in the trade war as well, used to bribe traders and secure their wares. In most journals documenting what the traders carried to their forts and in their canoes, brandy and alcohol were always a major part of the cargo. Both companies systematically diluted the alcohol and traded it to the First Nations, even knowing it caused social decay. Still, they would rip off the traders by swapping often-diluted booze for Made Beaver. Of course, the Aboriginal traders understood the game well. The phrase “fire water” does not refer to the throat-burning effects of alcohol. Rather, it refers to the bargaining process. Before accepting any booze, Aboriginal traders would take a mouthful and spit it into the fire. If it caused a flame, then it was a high proof. Good enough to trade for. Firewater. This gin bottle, though remarkable to see, is a sad reminder of the corrosive effects of the fur trade. We keep searching. That is exactly what they do. Bring alive a period of history that is disappearing ever so slowly into the waters and land of our North. A romantic, tragic, violent, courageous history that so few people seem to care about. But here, on this river, on the shores and on the riverbeds, it is so present, so alive and so relevant. We stay as long as we can at Missinaibi House, cataloging every artifact. It is the kind of place we had dreamed of finding when we came on this trip. But soon we have to tear ourselves away. The river calls. Over the rest of the week, we shoot more whitewater, painfully lug our gear over steep portages and scuba dive Long Rapids. The water level has softened the current here, but not so much that we can get right into the rapid. Along the shore, we find evidence from loggers and know from reading that this was a place where the forestry industry played a role. We spend hour after hour in the water but don’t turn up much until Paul and Steven locate an axe head. From behind our masks, it looks huge and ominous, the corrosion lending it a dark orange coat that hides its details. “It’s hard to date,” Kimberly says after taking a close look. “I have to dive it again, but I would say it was likely lost by loggers in the last hundred years.” She carefully measures and draws it. I find an old cast-iron cooking pan, also heavily degraded by time, just lying on the riverbed. We sense that here, in Long Rapids, we have inched past the fur trader years and are now into something more modern. The era where the first growth of forest in this part of the country was cut down to make paper for offices and build the houses in the south. It’s another story, with other heroes and villains. But this time, it is not ours. The more we dive the rapids, the more addictive it gets, even when the pickings are slim. After all, drift diving in the fast water is an exhilarating if slightly dangerous bit of business. Once the current grabs you it’s like taking a subway car for two stops. As you careen along in the low visibility you have to duck and dodge rocks and fallen trees along the bottom and hope not to get snagged on something. If you do, your dive buddy will be of little or no help. Paul calls these “Superman Dives” because he puts his arms out and simply flies along. On the second day at Long, we make a discovery. There is a beaver lodge nearby. We decide to dive it, to get a first-hand look at just how the animal that sparked this trade mania actually lives. “You wanna make sure that when you poke your head in that entrance there’s no beaver in there,” Matt cautions. We descend. The visibility is poor and we have to keep our fins out of the muck or it’s a hash. But poke our heads in. Its elegant underwater architecture, with its obvious front entrance and getaway hatch at the back, is a marvel. And the amount of wood and debris the beaver leaves at the bottom is another revelation. These little tree Hoovers built a country. After an hour, we leave the beaver’s home in peace. But now we have spent two days diving Long Rapids and we are getting exhausted. For all the thrills, the current makes accurate surveying of areas at or beneath the fulcrum of the rapid virtually impossible. And we have not found any muskets, or knives or swamped canoes. Still, I have learned to keep my impatience in check. I watch how Kimberly appreciates that the little discoveries speak of larger things. And how Les, like all of us, is really guided by much deeper impulses. A talk like that always means you must be coming to the end of a trip. Philosophy is best served in a bottle, after a week of hard work. We finish our trip at the railway crossing in a place called Peterbell. The irony is not lost on us. The death match between the North West Company and Hudson Bay Company ends in 1821 when, virtually spent, both companies realize that the only way to survive is to merge. One hundred and seventy-three different forts across Canada suddenly come under the Hudson Bay banner and the great trade war ends. But it is a shortlived period of stability. Soon the railroad connects the country from east to west and the reign of the voyageurs is snuffed out. Canoes are simply too slow. Not only does the river-based fur trade disappear into history, but the north-south trade routes also disappear. James Bay is no longer an efficient site from which to move goods overseas. Vancouver and Montreal, the southern port cities, replace it. Once Moose Factory closes, life on the Missinaibi shifts from furs to logs. And the beaver slowly, thankfully, returns. We toss the canoes and our mess of gear onto a passing Via Rail train. It has come from Vancouver, of course. Within minutes we go from one speed to another, and the river is gone. We all have a beer and watch the landscape shoot by. The tops of the huge black spruce trees twirl up to the evening sky like smoke. “It feels like we’ve just scratched the surface of this river,” I say, realizing that, of course, we actually went beneath the surface. We all know what she is saying. The story of who we are as a people is still under water, waiting patiently to be uncovered. This story was originally published in Outpost magazine, November–December 2009. Time Zone: UTC/ GMT -5 hours climate: The climate in Ontario can be unpredictable but is considered continental. While it ranges from hot and humid in the summers it can be cold and drop to below zero in the winters. Northern Ontario winters tend to be snow-covered with the lowest temperatures in the province. Because of Ontario’s size, regional temperatures can vary tremendously depending on exact location. Natural Hazards: Forest fires, floods. The best time to paddle is between June and September. Water levels are highest in June for those with the experience and skill looking for a greater challenge. Depending on the length of your trip, there are several optional starting points along the Missinaibi. To get to the head of the river in Missinaibi River Provincial Park, take Highway 101 from Chapleau. If you want to start further down the river, get off the Trans-Canada Highway at Mattice. Two of Missinaibi’s best-used routes are from Missinaibi Lake to Mattice and Mattice to Moosonee. These explorations can take seven to 10 days each and are ranked difficult. The route from Mattice to Moosonee is 322 kilometres with seven portages, and Missinaibi Lake to Mattice is 210 kilometres with 27 portages. Portages are clearly marked throughout the river and vary in length and difficulty. The location and length change with the water levels, though the average is about one kilometre. Campsites are limited. 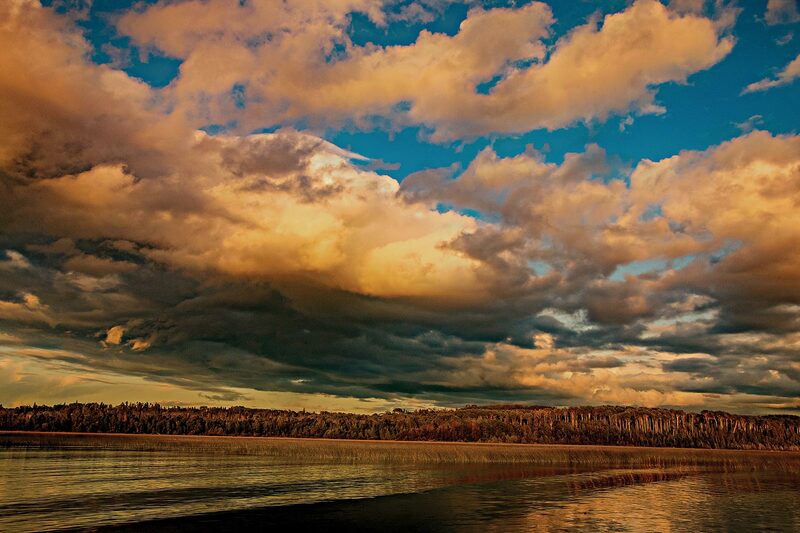 The river anchors the Chapleau Crown Game Preserve, the world’s largest wilderness sanctuary. Various hiking trails and less strenuous canoe routes can be found within the wilderness reserve, and with a hunting ban, the area is untouched by humans to experience animals and wildlife in their most natural habitat. 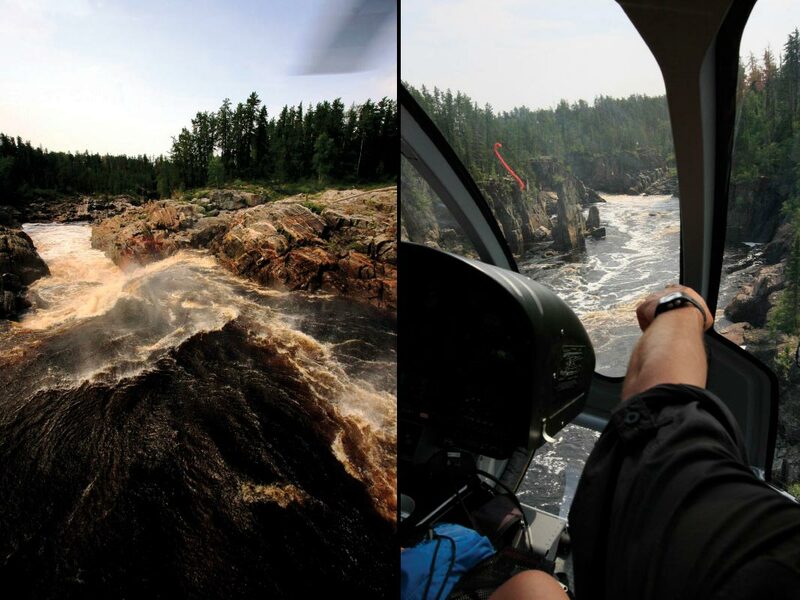 Missinaibi Headwaters Outfitters are the high adventure river expedition experts. Their team of adventure aficionados—professional paddlers, naturalists and teachers—will provide any level of support you need for your expedition. 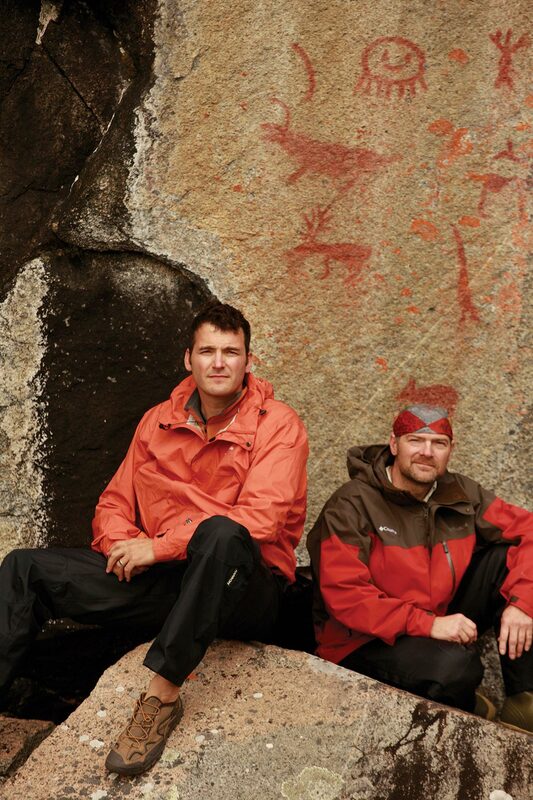 From self-guided to family to instructional adventures, Missinaibi Headwaters Outfitters (missinaibi.com) promises history, scenery and, above all, adventure. To book an expedition of your own, contact the experts at 705-607-0276 or [email protected]. Evan Solomon is a Canadian columnist, political journalist and radio host. He's travelled with Outpost across North America on innovative historical projects. Yes, Sandy, so true. So much history there, in these waters of Canada! We had a fantastic experience, especially working with local outfitters, who were spectacular.